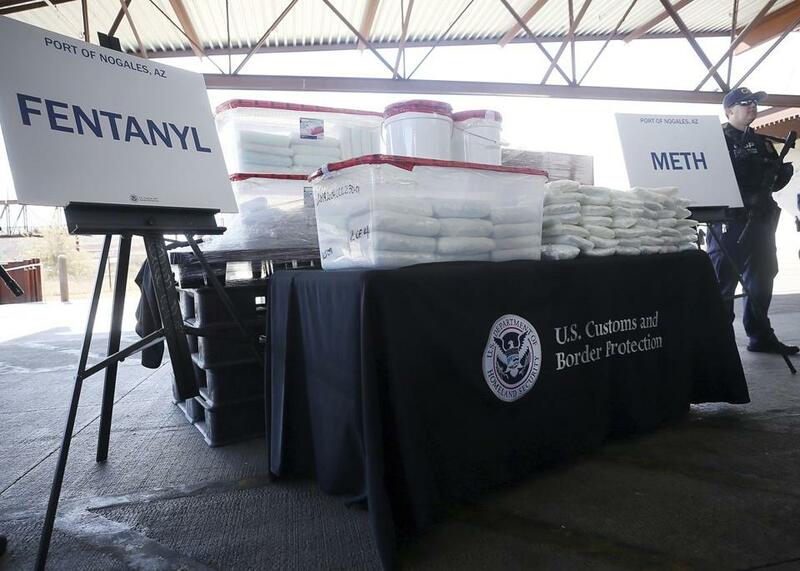 A display of the fentanyl and meth seized by Customs and Border Protection officers over the weekend in Arizona. When the death toll from opioid overdoses began to soar a few years ago, the evidence was clear how it all started: Painkiller prescriptions had tripled in a decade, exposing millions of people to the risk of addiction. Policy makers naturally sought to put a lid on opioid prescribing. But a study published Friday in JAMA Network Open finds that reducing opioid prescriptions will have little effect on the death rate over the next few years, now that the epidemic is dominated by heroin and illicit fentanyl. The study offers a countervailing view at a time when authorities are warning or even prosecuting high-prescribing doctors and numerous state and local governments are suing over the conduct of opioid manufacturers, including whether Purdue Pharma deceptively marketed the popular painkiller, OxyContin. A team that included researchers from Massachusetts General Hospital and Boston Medical Center employed mathematical modeling to project what could happen over the next several years. They predicted that opioid-related mortality nationwide would double or triple from 2015 levels, reaching around 82,000 a year in 2025. The projections showed that restrictions on prescription opioids — such as a Massachusetts law requiring prescribers to consult a database that can flag doctor-shopping, and another that limits the length of new prescriptions — would reduce opioid deaths by only 3 percent to 5 percent in the near future. In many states, the vast majority of opioid-related deaths involve heroin or fentanyl, and prescription drugs account for only a small number. In Massachusetts in 2018, fentanyl was found in 90 percent of people who overdosed, while prescription opioids are present in only 17 percent of cases. And opioid prescribing, although still high, has been decreasing since 2010. Larochelle said that restricting access to pills can drive people to more dangerous street drugs. The research, however, failed to persuade two prominent advocates of limiting opioid prescribing. One said it contained errors and the other said it overlooked the fact that taking prescribed opioids can lead to heroin use. Dr. Andrew Kolodny, a Brandeis University researcher and executive director of Physicians for Responsible Opioid Prescribing, said the study contained errors and he was surprised JAMA published it. “The projections have already been disproven,” he said, pointing to federal data that show the number of opioid-related deaths leveling off nationwide in 2018. The JAMA Network Open study instead projects the death toll to continue rising. Kolodny also said the researchers based their work in part on a “misleading” study that suggested an increase in the number of people whose first opioid is heroin. In fact, the number is decreasing, he said. The research team gathered data on the trajectory of the opioid crisis from 2002 to 2015, and used that data to project numerous scenarios for the years 2016 to 2025. No matter how the epidemic played out in the different projections, including an optimistic scenario where deaths leveled off, reducing the misuse of prescription opioids still showed minimal impact, they said. “Our study does not devalue the efforts to reduce misuse of prescription opioids, [but] these efforts in isolation will not bend the overdose death curve,” said Jagpreet Chhatwal, senior scientist at MGH’s Institute for Technology Assessment and the study’s co-lead author. The researchers acknowledge imperfections in their models. “It’s really hard to predict the future,” Larochelle said. But they say none of the limitations undercut the study’s fundamental conclusion that lowering the misuse of prescriptions won’t make much of a difference. The authors argue that policy makers need to focus on increasing access to effective treatment, especially with medications such as buprenorphine and methadone, and reducing deaths among those not in treatment, by expanding the use of the overdose drug naloxone, needle exchanges, and creating safe places to use drugs. Dr. Scott Hadland, a Boston Medical Center addiction specialist who was not involved in the study, agreed with the study authors that “limiting the supply of prescription opioids is not going to be the primary answer” to reduce deaths in the short term. But Hadland, a pediatrician who recently published a study showing a connection between marketing efforts by opioid maker and fatal opioid overdoses, added that opioid prescribing still requires attention for the long term. In national surveys, about 4 percent of high school seniors report using opioids without a medical reason, and high schoolers are 10 times less likely to use heroin, he said. Looking ahead to these teens’ lives after 2025, Hadland said, it remains important to prevent young people from misusing prescription opioids.